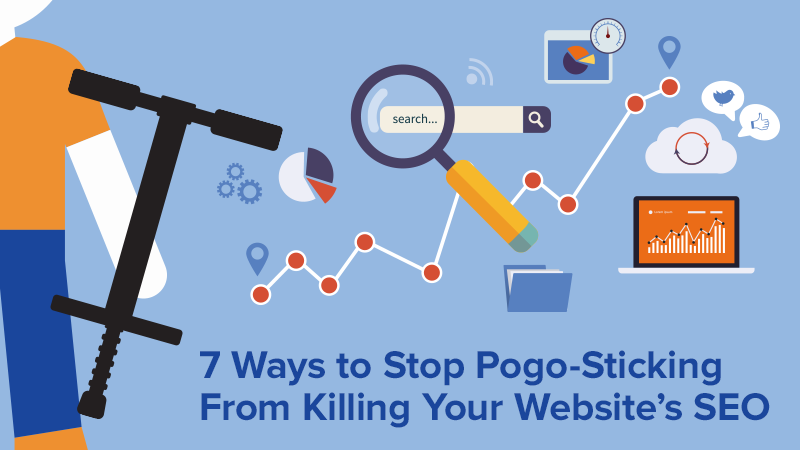 Pogo-sticking is not as fun as you might think, at least not when it comes to SEO. It could be negatively impacting your rank in search results. What is pogo-sticking? Pogo-sticking is the back-and-forth action of someone on a search engine results page (SERP) clicking on a result and immediately leaving by hitting the back button on his or her browser to find a more relevant result. If you're experiencing a high volume of pogo-sticking on your website, then you should rethink your SEO strategy. To help, we've compiled seven ways you can stop searchers from immediately jumping off your website and killing your SEO. 1. Make your content relevant to the searcher. No one wants to search for something, click on a promising result, and then see that the webpage's content is irrelevant to the original search.. This is why it’s important that your webpage's content (text, photos, videos, etc.) is complimentary to your webpage's title and metadata. This will help you earn trust from the searcher and the search engine. Here's an example: If we wrote a blog post titled “The 10 Best Dog Videos on YouTube" but didn't bother to link or embed any of these videos on the webpage then we're not giving the searcher what they want (and we're being dishonest about what the page is about). The best content answers questions and solves problems. Engagement is key! People only search for what they want to find. Make sure the title of a page accurately and effectively meets a searcher's expectations of what they will find there. Introduce the page topic right away (“fluff” is a big no-no). This allows for quick engagement and it doesn’t waste the searcher's time. If you are having trouble creating content for a page or a blog post, take inspiration from others who are ranking well and are receiving a lot of quality clicks. 2. Make your content easy to read. Now you have the relevant content everything is fine, right? Not necessarily. Fluff is something to avoid at all costs. It’s basically like a movie that never gets going. So, give searchers what they want right away. So, while we're on the subject of being fast, here's a question for you. Which would you rather read? If you chose the one on the left, then you must love squinting and tired eyes. Most of us don't prefer to sift through paragraphs to find what we want. We like to get what we're looking for as quickly as possible. The example to the right provides us with a reader-friendly approach which makes it easy for us to find exactly what we're looking for. Format your blog content with the reader's time in mind. Use subheads, bulleted lists and numbered steps with clear titles to allow the reader to easily jump to page sections that matter most. 3. Make your content easy to find. What's the point of having great content if searchers are unable to find it? When a searcher can’t find your content they can’t engage with your website, which results in them not engaging with your business online (which could cost you a customer). With this being said, it's very important to know your sitemap. This is a directory of every page on your website. Search engines use your sitemap to crawl and index your website; meaning you need to make sure that there are no broken links on your website. A broken link can stop a Google crawler from indexing your website, which can result in poor performance on search engines. This also affects user experience, because no-one likes clicking on a page that can't be found. Use Google’s Search Console tool to find any broken links on your site and meet with your web developer to fix any problems. Use social media and email to share direct links to your awesome content so your audience has easy access. 4. Go easy on the pop-ups. Maybe you don't use any, or maybe you're pretty aggressive with them, but the truth is, pop-ups can work. But you have to be careful. Some visitors will be turned off by them. No-one likes spam because it feels like a business is forcing its products on you. Pop-ups can have that same effect. So, how do you create a pop-up that serves its purpose (gathering email subscribers or generating leads) while not being over-aggressive? If a visitor has frequented your site regularly but hasn't engaged with one of your pop-ups, chances are they are not going to this time around. You can put a cookie on your website to track who is a returning visitor and target the pop-ups for those who are new to your site. Use simple design and compelling CTA, while not asking for too much information so that you don’t seem to be imposing on a visitor's privacy. 5. Have a responsive website design. With Mobilegeddon well in the picture, this point is extra important. This “responsiveness” is not only a ranking factor for Google searches, but essential for user experience. The fact is, more people are searching on mobile devices than on traditional desktops, and this is proving to be a competitive advantage for businesses. Check to see if your website is mobile-friendly by using Google’s Mobile Friendly Test Tool. If your site is not mobile-friendly, get in touch with your webmaster ASAP. 6. Make your website faster. 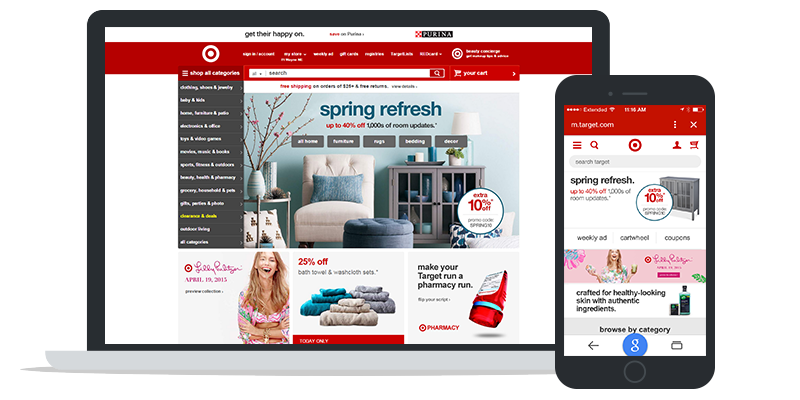 47 percent of consumers expect a web page to load in two seconds or less. 40 percent of people abandon a website that takes more than three seconds to load. A one second delay in page response can result in a 7 percent reduction in conversions. On second thought, if you are dealing with a slow website these numbers might not be fun at all. You need to speed up your website or you will continue to lose out on potential business. There are a lot of ways to decrease load time, but we recommend you reach out to your webmaster to see what steps can easily be taken to speed your site up. 7. Use color and images wisely. Well, sometimes that’s true. The truth is, there is a right and a wrong way to use color and images when it comes to website design. A poor design can negatively affect your user’s experience. Website design is always changing, but right now, neutral pallets and minimalist designs are popular. We recommend checking out a website design leader like Squarespace to see styles that are trending. Read up on the psychology of color. Make sure that you are not utilizing too many colors on your website. A good rule of thumb is to use only around three or four colors within your color scheme. Use only images that represent your business’s image accurately. This allows searchers to have a quick idea of what you’re all about.